When you imagine remodeling your bathroom we are willing to bet you envision bumping out a wall or two to create a little more space. Maybe relocate the fixtures. Add room for a linen closet. Do any of these thoughts sound familiar? Making your space bigger and better might be the dream. But moving walls and plumbing is not within every budget or appropriate for every home. So how can you make the most of the space that you do have? Over the years we’ve helped a lot of homeowners rediscover just how great their modestly sized bathrooms can be. 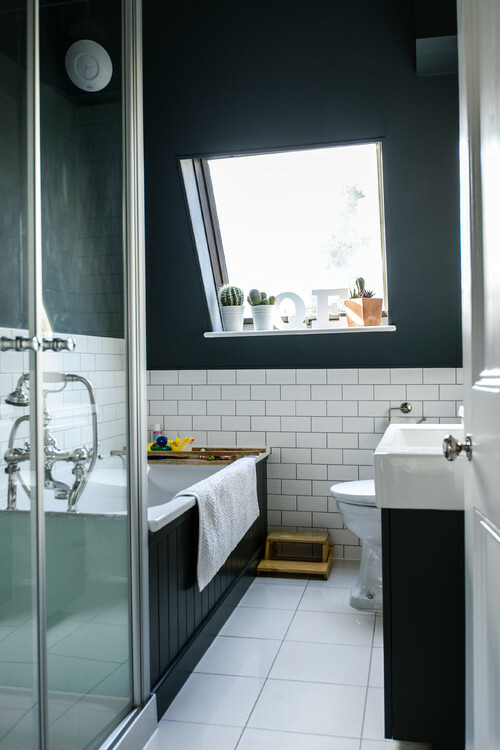 Keep reading to find out our top tips for making your bathroom feel bigger than it actually is. Have you ever noticed that brighter spaces tend to feel more open? 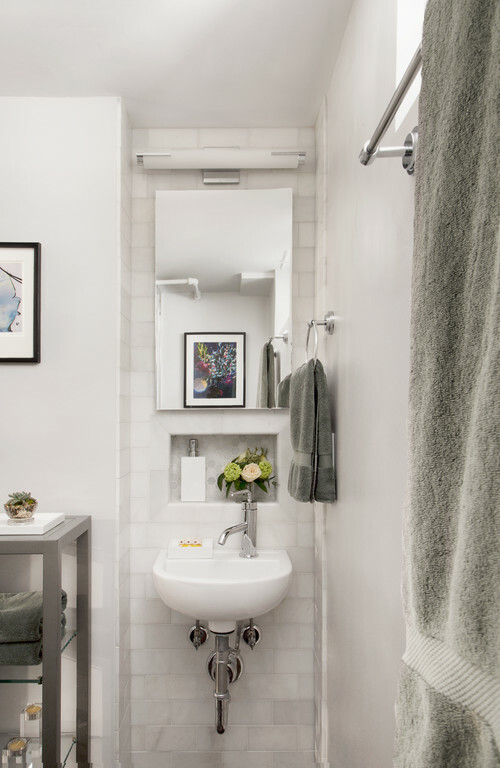 Maximizing the light in your bathroom is a great way to make it feel bigger. Natural light is especially transformative. If it works with your room’s layout add a window or skylight. Even if you can’t bring in natural light you can still incorporate additional lighting to your bathroom. Having multiple light sources, as opposed to a single overhead light or vanity light, will eliminate that dark and dreary feeling and make it easier to see as you get ready in the morning! Once your bathroom is well lit it is time to bring in the reflective surfaces. Glazed tile, white porcelain, glossy trim, and metal fixtures. 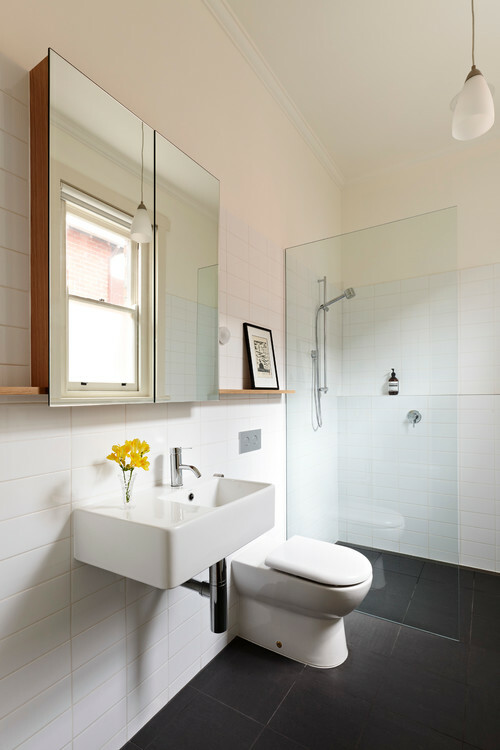 Reflective surfaces keep your bathroom feeling clean and bright. Adding tile or beadboard painted a glossy white to the walls of your bathroom is another great trick to bounce light back into your space. Painting all of the drywall the same color helps to blur the harsh line that occurs during the transition between the walls and ceiling. It may seem counterintuitive, but this even works if you choose a darker paint color. If you can live without a bathtub, switching your combination shower and tub to a zero-threshold shower with a glass surround is a great move. It will visually open up your room and save you a few inches of precious space that the rim of the tub used to take up. Are you ready to make your bathroom look and feel its best? We are here to help! Contact us today to schedule your free consultation. Older PostUpdating Your Kitchen Cabinets: Repaint, Reface, or Replace?